There’s More Recreation in Ridgeland. We know that staying active from an early age is one of the best ways to live a full and rich life. As a city, we meet our citizens’ love for excercise with safe and accessible park facilities and a diverse recreational program. 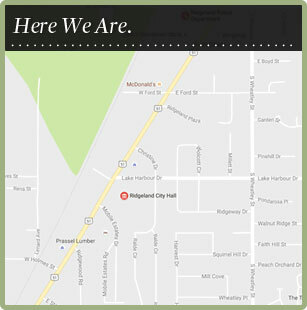 Ridgeland owns and manages three parks located throughout the city: Friendship Park, Freedom Ridge Park, and Wolcott Park. Friendship Park is home to playgrounds and pavilions, as well as a shaded walking trail. Freedom Ridge Park offers baseball, softball, and soccer fields as well as two playgrounds. One of these playgrounds is Adam’s Project, an all acessible playground for children who are handicapped or have special needs. Wolcott Park is home to softball fields and the Ridgeland Tennis Center. Seasonal fields are available for socccer and t-ball practice at Ridgeland City Hall. The city also offers recreational facilities such as the Ridgeland Recreational Center, Ridgeland Tennis Center and Ridgeland Mulituse Trail. The Recreational Center offers activities such as our Superstar Seniors program and Tai-Chi classes. The Ridgeland Tennis Center is the largest public tennis facility in the state and is home to seventeen tennis courts. Youth organizations such as the South Madison County Soccer Organization and the Madison-Ridgeland Youth Club utilize Ridgeland Parks for a variety of organized sports. The Ridgeland Multiuse Trail is a fifteen-mile, multiuse trail suitable for walking, running, or cycling. The Natchez Trace Parkway is a designated bike route that traverses Ridgeland with parking available at the Ridgeland Information Cabin at Rice Road. Other designated bike routes in Ridgeland include Highland Colony Parkway. See the trail map here. Ridgeland is also partnered with the Tri County Mountain Bike Association to provide a mountain biking and hiking trail. Maps and details of this trail can be found here. Ridgeland also offers miles of shoreline of the Ross Barnett Reservoir, where you can enjoy fishing, boating, water-skiing, swimming, and other water-based recreational activities. Old Trace Park at the Reservoir offers trails and plenty of green space for play and shoreline for fishing. With so many recreational opportunities, the citizens of Ridgeland can often be found outdoors being active.